Michael Woods became the first Canadian to podium at Liège-Bastogne-Liège when he sprinted to second place in Ans on Sunday. 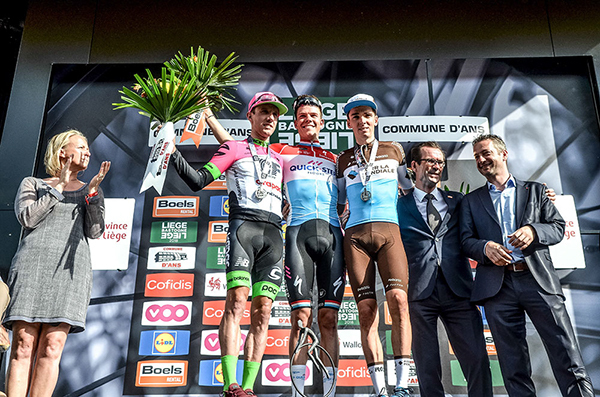 The 31-year-old bested Romain Bardet (AG2R La Mondiale) in a two-up sprint, 37-seconds after Luxembourg road champion Bob Jungels (QuickStep Floors) soloed to victory. "I struggled a lot at the start of the season with illness," said Woods. "I didn't have the season start I wanted to. Today is the first day I actually felt like a bike racer again. I felt awesome throughout the day and had really great support from the guys." The fourth Monument of the season unfolded predictably until the final hour of racing. Nine riders slipped away in the opening 10 kilometres of the hilly 286-kilometre race. Bahrain-Merida lifted the pace on the run-in to Roche-aux-Faucons, overtaking Baugnies just before the penultimate climb. Philippe Gilbert (Quick-Step Floors) was the first of the danger men to make a move on the 1.4-kilometre climb. Gilbert's move was countered by Sergio Henao (Sky), who drew out Jungels, Woods and Jakob Fuglsang (Astana). 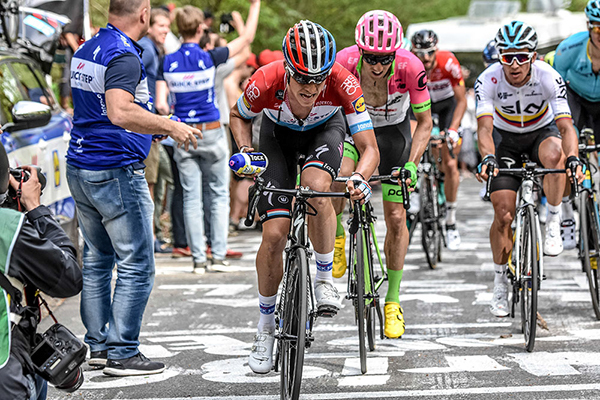 Jungels was the first to crest the official top of the climb and persisted with the effort beyond the summit marker, immediately opening up a gap. "I was a bit to blame for that," admitted Woods. "I was right on his wheel, and I grabbed a gel when he went. He rode a strong and courageous race. I wouldn't expect anything less from him. He's a classy guy." Jungels admitted, "To be honest, this came as a surprise. I didn't believe I could pull it off until I saw that nobody was behind me as I was approaching the finish line. Yesterday evening I watched together with Julian [Alaphilippe] the 2011 edition, when the winning move was made on Roche-aux-Faucons, and I made my attack in the same place. I was waiting for this victory for a long time and to finally get it is pretty unreal." 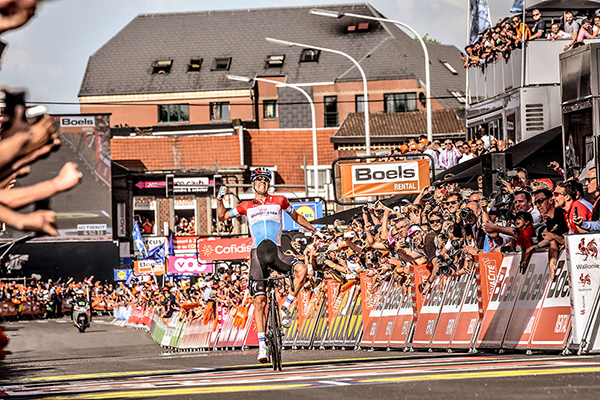 Jungels is the 12th different Quick-Step Floors rider to taste success this year. The long-range attack proved the race winning move as the chasers scrambled to organize. 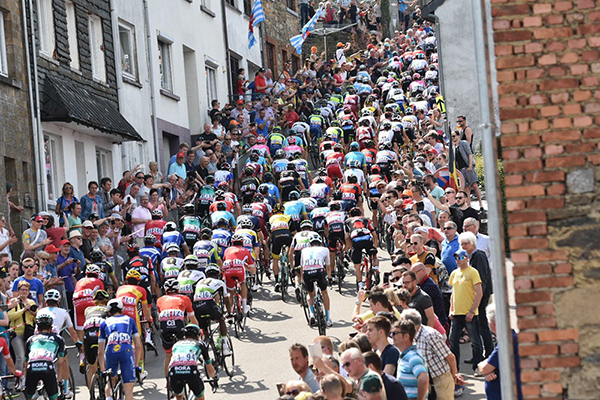 Several counter-attempts failed to gain clearance until Jelle Vandendert (Lotto Soudal) escaped on Saint-Nicolas, five kilometres from the finish. As the chase lulled, Bardet attacked. "Bardet made an excellent move," said Woods. "I knew as soon as he went that it was the move to follow. I was able to get on his wheel, and we worked fairly well together up the climb." 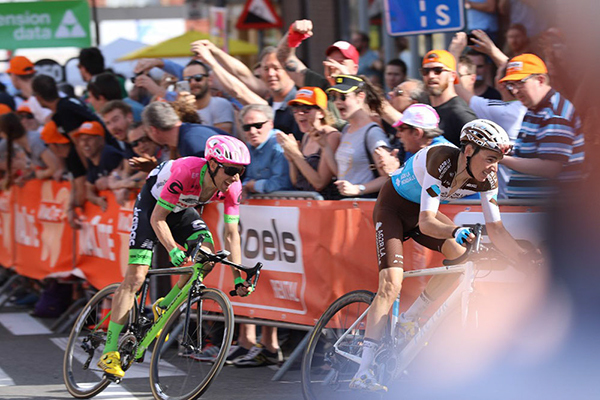 "Our takeaway message for the guys last night was they had to put themselves in the race and they had to go out there and take the chance today because if they waited and waited and waited, it was going to be too late," sport director Tom Southam said. "Mike took his opportunity. I think he was, after Jungels, the best guy in the race. You could see that in the earlier climbs. Had he waited and come in with the group, he may have come seventh or fifth or whatever. He really did the right thing by taking his chances. He showed how good he was with a solid second." "Woods is clearly progressing in his ability to read a race and to ride in front of the peloton," team boss Jonathan Vaughters added. "Following Bardet's attack showed newfound tactical savvy." For Woods, the result is yet another confirmation of the potential the team saw in him upon offering his first WorldTour contract three years ago. "JV told me I could win an Ardennes classics, and I didn't believe him when first told me," said Woods. "Now I'm starting to believe." Woods' parents were on hand to see his historic achievement. Wife Elly Woods watched from the couple's in-season home in Girona. "My wife had some tough news a few days ago, and I really wanted to get a good result for her here," Woods said. "I finished the race and gave her a call. We shared a big smile. I'm really happy to pull something off for her and the team after a tough start to the season."